You'll be £8.99 closer to your next £10.00 credit when you purchase M12 Gun Motor Carriage. What's this? The ability to rapidly ready heavy artillery for firing lead to the development of the M12 155mm gun in 1941, based on the M3 Medium Tank chassis. The trial vehicle, built by Rock Island Arsenal, was designated T6. To accommodate the large, rear mounted weapon – a French-made M1917 155mm gun, the engine was relocated forward to a position just behind the driving compartment. A hydraulically operated spade mounted at the rear of the vehicle, which was lowered during firing to anchor the vehicle against the recoil. When retracted into the travelling position it provided a seat for two of the six crewmen. The production run was between September 1942 and March 1943, with a total of one hundred units being built. Though a few were used by training units, most were placed in storage until February 1944, when the first of 74 of them were shipped to Baldwin Locomotive Works to be improved based on further tests and usage in training. This work continued until May 1944. The M12 would earn the nickname "Door Knocker" for its pounding of the German Siegfried Line. The book ends with a detailed look at the sole surviving M12 which languished at the Aberdeen Proving Ground before restoration and placement at Fort Sill. This chapter is of essential value to model makers because Mr. Doyle’s walk-round photography appears to cover every nut and bolt. As ever, it is the combat and training stuff that attracts the most, and there are a good few corkers here, especially action shots from the Bill Larkin collection. The images from Dan Ballou are also effective, and one showing a full battery firing conveys all the mud and noise of campaigning. The book covers every aspect of the M12's limited service with the U.S. military. Included are excellent black and white as well as some incredible close shot, colour photos. For someone building a model of this gun, this book has all the essential details including interior detailing, unit signage and ammunition types used. I also found this book interesting inasmuch as it covered a subject that, strangely enough, only ever served with the United States Army. Unusually, at this time, Britain was crying out for armoured weapons but refused to consider the M12. Highly recommended to model-maker's and historians. 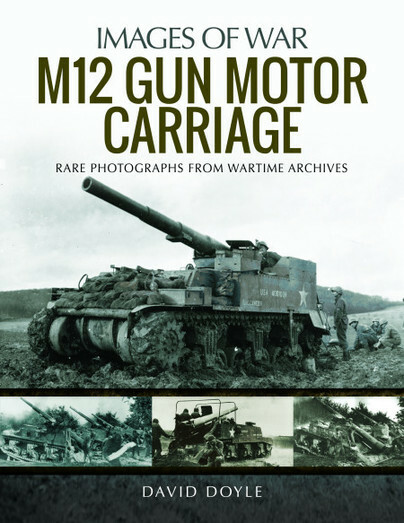 Excellent for anyone with an interest in WW2 artillery and ideal for the AFV modeller for not only the detail of every facet of the M12, but archive photos which give plenty of diorama ideas as well. Recommended. An avid military vehicle enthusiast whose collection includes 10 Vietnam-era vehicles, it not surprising that most of his 100+ published books focus on US military vehicles. In June 2015, he was presented the coveted Bart Vanderveen Award by the Military Vehicle Preservation Association, given in recognition of "…the individual who has contributed the most to the historic preservation of military vehicles worldwide." Some of David Doyle's published works are - Panzerkampfwagen IV: The Backbone of Germany’s WWII Tank Forces; U.S. Half-Track Vehicles In Action; M151 Mutt In Action; The Complete DUKW Historical Reference; P-47 Thunderbolt In Action; B-17F Flying Fortress A Visual History of the B-17F Flying Fortress in WWII; USS Iowa (BB-61): The Story of "The Big Stick" from 1940 to the Present.